If you have chosen to homeschool in North Dakota, you may need information, resources, and curriculum that will help you get started. This page aims to help guide you through the process of homeschooling in the Peace Garden state. Take a few minutes to read through it, and feel free to share this page with other new homeschoolers in your state. If you have questions or comments about homeschooling in North Dakota, check out the homeschooling tools and resources or visit the online North Dakota support group. *This information was not compiled by a lawyer. This should by no means be interpreted as legal advice. It is your responsibility to interpret and understand the laws that you will be homeschooling under. Learning happens all the time in homeschool. Say you strongly believe in the principles of unschooling. In that case, your days are spent learning through play, real life experience, and guided research using multiple sources. Each day is vastly different. Lessons happen when a question is posed, a problem presents itself, or a project is proposed. One day you might play board games, bake bread, work in the garden, research on the Internet, study Time4learning, go swimming at the Y, cook dinner together, and have book reading time. The next day, you might watch videos on YouTube, play at the playland in the mall, go to the pet store, cook lunch together, build snap circuits, play language games, make an obstacle course in the living room, make clay sculptures, dance to Latin music, do math with magnetic numbers on the fridge, and have in-depth discussions. You will more than likely be doing many activities at one time. It is amazing how many things can fit into one day when learning happens all the time. Time4Learning’s experience shows that there is no single, best homeschool material. Rather than feeling torn between homeschool resources, parents should select a diverse blend of materials and activities. For families with more than one child, choosing a homeschool curriculum can be more problematic. What works for one child may not work for another. What works for one subject may not work on the next. What works one year, may fall flat the very next year. Time4Learning appeals to a wide range of learning styles. Our online learning materials are especially well-suited to children who are visual or kinesthetic learners. These children can take advantage of Time4Learning’s interactive, multi-media materials. Children like using the computer to learn. It’s a convenient, interactive homeschool resource that provides a welcome change each day to paper-and-pencil workbooks and textbook-based lessons. Time4Learning is proven effective with homeschoolers, has a low monthly price, is easy-to-use, and provides a money-back guarantee so you can make sure that it works for your children! Sign up for Time4Learning as part of your overall homeschool curriculum. If you have any more questions or comments about homeschooling in North Dakota, head over to the North Dakota Parent Forum. 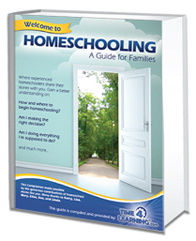 Welcome to Homeschooling Guide – Are you new to homeschooling?This guide was written by seasoned homeschoolers to answer some of the difficult questions new families often struggle with. Curriculum Lesson Plans – An overview of what’s available for each grade and subject. Homeschool Portfolio Information – Answers common questions about homeschool portfolios and evaluations. It includes tips on organization methods, what to include and how Time4Learning can be used as part of your homeschool portfolio. Online Parent’s Forum – Reach out to homeschoolers in your area, join discussions, ask questions and trade ideas on our online community of homeschooling parents. Having the support of seasoned homeschoolers can really help make your homeschooling journey a success. Hints & Help Section – Whether you’re new to Time4Learning, a long term member, or a future member with questions about how the program works, this section answers questions about navigation, lesson planning & previewing, how the teacher guides and worksheets work, and more! Puffin Academy App – Learn how to use Time4Learning on most mobile devices with the Puffin Academy app for iOS and Android! Get details on this kid-friendly app, including how to download and use it on the go with Time4Learning.